Richard has over 25 years of experience in the horseracing industry. He initially worked for Sheikh Mohammed’s Darley operation and Anthony Stroud, before setting up his own agency in August 2007. Richard is a popular and highly respected figure who has a wide range of contacts within the world of racing. Over the years Richard has sourced and purchased a host of winners for a long list of influential owners and trainers. He has an outstanding knowledge of the form book and pedigrees, enabling him to pinpoint stars of the future. A list of major winners purchased by Richard can be viewed here. 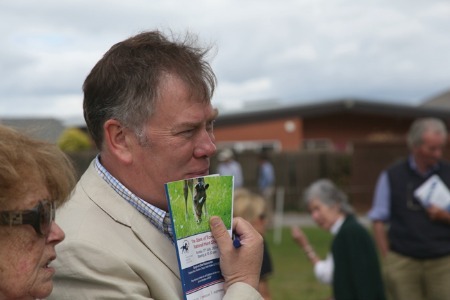 Richard also has experience of finding top quality stallions and broodmares. He has brokered the deals to purchase and lease many top stallions around the World. Please click here for a list of Stallion deals brokered by Richard. Richard is closely involved in the breeding industry and has excellent contacts with several professionally run studs all over the World. He is able to assist and give advice with the booking of mares into any European based stallion as well as obtaining the best stallion fees available. Richard was responsible for the planning and booking of Eurolink Artemis into Myboycharlie, resulting in Grade 1 Beverly D Stakes winner Euro Charline. Richard is committed to finding more top class performers and provides a wide range of services essential to the bloodstock industry. He can also help with boarding arrangements for travelling mares.